Adults spent 19 more minutes per day interacting with media in Q1 than the previous quarter. The average U.S. adult now spends more than 11 hours each day—almost half the entire day—listening to, watching, reading or interacting with some form of linear or digital media. That’s according to the Q1 2018 Nielsen Total Audience Report, which was released today. Adults now spend 11:06 (in hours:minutes) per day connected to linear or digital media, which is up 19 minutes from the previous quarter (10:47 in Q4 2017). 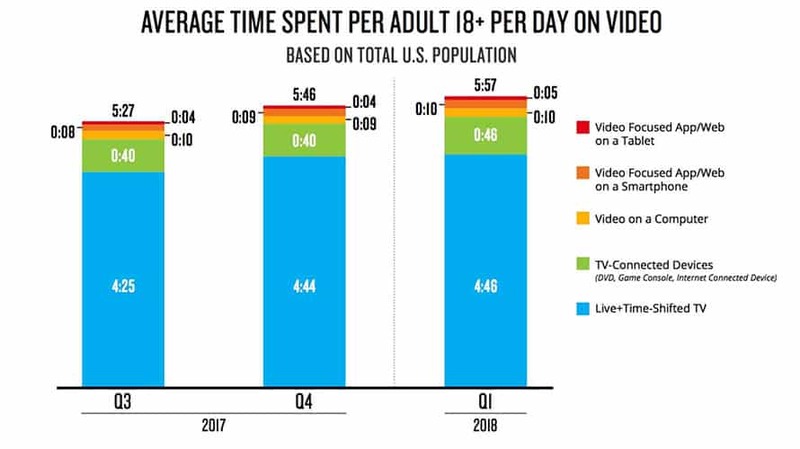 Quarter to quarter, adults spent five minutes more per day on average using connected TV devices (like Apple TV and Roku) and 13 minutes more using digital platforms. 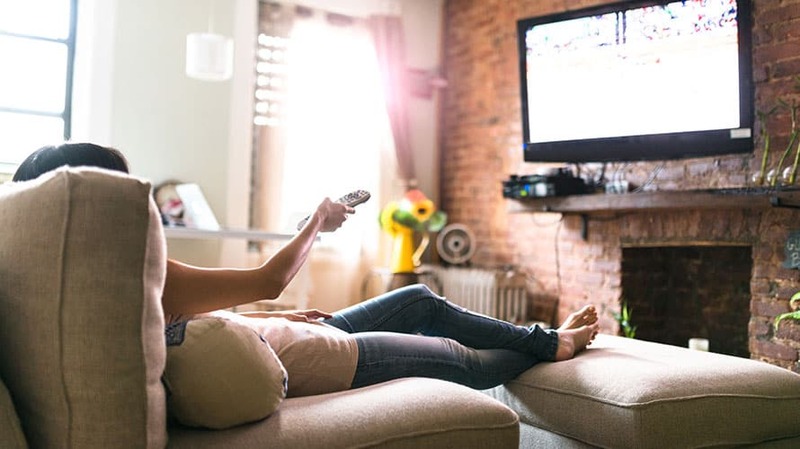 Live TV viewing has been on the rise during the past two quarters, up from 3:54 in Q3 2017 to 4:10 in Q1 2018, though Nielsen said that could be at least partially explained by seasonal patterns, as winter weather could cause adults to spend more time indoors watching television. Adults spent almost six hours a day (5:57) watching video alone, either on TV, computer or using a video-focused app or website on a smartphone or tablet. Two-thirds of U.S. TV households (67 percent) now have a connected TV device that can stream content to the TV. In those connected TV homes, streaming to the TV set accounts for 10 percent of all TV usage on average. Nielsen found that 64 percent of homes have access to at least one of the three big SVOD services (Netflix, Hulu or Amazon), which is up from 58 percent a year ago. Across the U.S., 27 percent of TV households have access to only one of those SVODs, 37 percent of access to more than one service and 11 percent have all three. 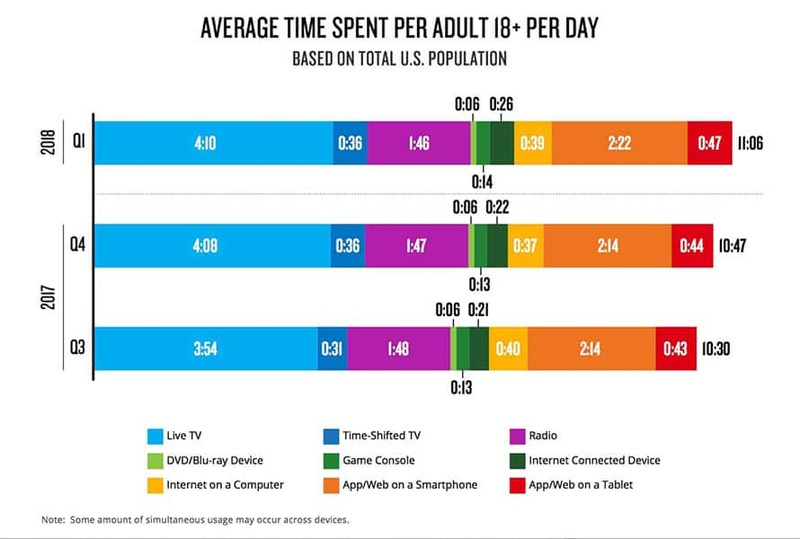 Adults 18-34 spend the largest percentage of time with connected TV devices and digital devices compared to other demographics. Thanks to live TV streaming offerings like DirecTV Now and YouTube TV, 2.7 percent of TV homes now subscribe to a vMVPD (virtual multichannel video programming distributor). And most of those who live in homes without TVs are still finding ways to watch video content. Nielsen found that 82 percent of non-TV households still view video content, via computer, smartphone, tablet, at a friend’s house or at work.